Saint Blase - My Catholic Life! A secularist does not evaluate religion on its own terms but on its practical benefits. Is a religion true? It doesn’t matter. But if you can prove that empty stomachs are now full, that malarial fevers are cooled, and that formerly dusty roads are now paved due to religion, then religion is indeed useful and good, all truth claims aside. Religion’s role in physical healing would be another proof of its great good, if not its truth. For all the incontestable progress of medicine, cancers still spread, tumors still grow, and infections still poison. Even the most modern of moderns, in a state of total vulnerability, understands in his deepest of deeps that physical healings surge from sources other than modern science. PhDs wash in the River Ganges, rocket scientists lower their bodies into the cool baths of Lourdes, and surgeons spread sacred oil on their skin hoping against hope for a cure that has eluded them. The memory of Saint Blaise, a man of obscure origins, stands behind one of the most enduring healing traditions in all of Christianity. In the holy name of Blaise, two candles are crossed, X-shaped, and pressed against the neck to ward off and cure diseases of the throat. Oil and ashes, candles and flames, bread and wine, words and blessings. God’s face does not appear in the ash cloud of a volcanic eruption or in a golden pile at the end of a rainbow. The Christian believes that God’s salvation and healing power come through His Holy Mother, through His saints, and through the creation He molded in His own hands. A believer doesn’t believe in belief, any more than a soldier loves patriotism. A soldier loves his country, and a believer loves God. And because the believer loves God, he loves a someone, not a something, and waits in line and shuffles forward, step by step, to the priest holding those X-shaped candles on today’s feast. 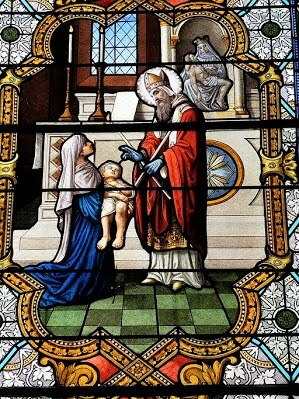 Saint Blaise is primarily a “northern” saint called upon to remedy mostly cold climate ills. Because it is usually winter, then, the believer adjusts his jacket collar, feels the milky wax candle against his tender throat, closes his eyes, and prays that the cough disappear, that his voice remain strong, or that the faintest lump turn out to be nothing at all. 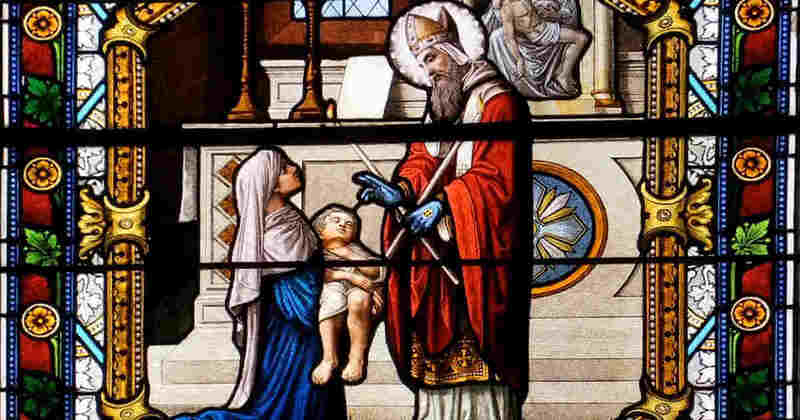 Details of Saint Blaise’s life are difficult to verify. Some traditions, dating from centuries after he lived, state that he was a bishop in Armenia, east of modern day Turkey. His reputation for holiness drew people to him in search of a cure for their infirmities. It is said that Blaise was tortured and murdered in an anti-Christian persecution. Every saint, no matter how remote his life or obscure his story, casts some light on the truths of our faith. The life of Saint Blaise and the tradition of throat healing that still surrounds him tell us that holy lives have power. His life tells us that holy people intercede for less holy people, and that the less powerful, the less wise, and the less good depend on the strong, the intelligent, and the good in order to leave their state of dependence, ignorance, and sin. In the same way that salvation is mediated, healing is as well. Whether through the skilled hands of a surgeon, the chemicals of a drug, or the intercession of a saint, healing comes. The many channels branch out from the one source who is God. We, the faithful, when fragile and afraid, patiently sit in the doctor’s office for our name to be called, wait at the pharmacy counter for the prescription to be filled, or line up in church for the candles to rest softly on our clavicles. Healing is an offer, we are ripe to be cured, and any sacred intervention is welcome, no matter whence it comes. Saint Blaise, many centuries ago you suffered for the same faith we now share with you. May we be ever united to you in our common Church, and may we be healed of all infirmities of the throat through your heavenly intercession..